Have you ever wondered why people take drugs? Now me, being a somewhat inquisitive and open-minded person by nature, do find it interesting to figure out why some low-life scum wants to be smashed out of their heads for the sheer hell of it. As a matter of fact, just like these guys and girls too. Director: Alejandro González Iñárritu; and Actors: Sean Penn, Naomi Watts, and Benicio del Toro. But only in 2003, and for 127-minutes. Paul Rivers (Sean Penn) is a mathematician who is dying of heart failure / trying to conceive a child with his ex-girlfriend / and out and about searching for someone that only he knows. Whereas Cristina Peck (Naomi Watts) is a devoted mother / a lonely woman high on drugs / and a tiered individual worn down by the tragedies of time. And as for Jack Jordan (Benicio del Toro) on the other hand, he is an ex con who is a religious zealot / a strict disciplinarian to his children / and a loving husband to his put-upon wife. By accident, Jack runs down Cristina's husband and children in a tragic car accident. Now just before Christina's spouse dies, she is willing to donate his organs to a donor program. Paul gets Christina's husband's heart, and with it a new lease of life, plus an inquisitive nature as to whom his heart once belonged to. There, that was much better, wasn't it? Unlike Jack's mind. You see, distraught by what he has done to Christina's family, Jack hands himself in to the authorities, and spends quite some time in prison. Suicidal, and begging for the good Lord for some forgiveness. Meanwhile, whilst Jack is inside, Paul decides to find out whose heart he has. And so, on numerous occasions, he follows Christina around town; and in each instance tries to befriend her, without really explaining to her why he is doing this. Moreover, as days turn to weeks, the forces of nature conspire to bring Jack, Paul, and Christina together again for their very first / last time. Well, I suppose that is why what next transpires is a right puzzlement of the elements all in all. As death comes a knocking - lives need some blocking - love is in the air - and nobody is ready for despair. Before I give you my opinion on this very artistic and well-polished slice of cinema, '21 Grams', please allow me to tell you two very important stories from my own life, just to explain to you how I perceived this movie. Just like Sean Penn's character in this film, I too have had a donor transplant in my time. Two as a matter of fact. And do you know what? I have to state for the record that I do feel that this procedure did change me as a person. On numerous occasions I have behaved and done things that I did not normally do prior to my operations. Moreover, I still have an inquisitive nature as to who my 'donor' really belonged to. Fact. STORY TWO: EYES DOWN FOR A FULL HOUSE? Have you ever read a role playing book before? I have. It is a piece of story ladened literature that you read through, and on certain pages, make certain decisions, so you can progress along the tale. For example - if you want 'Timmy' to go through the door, turn to page six. But if you want 'Timmy' to go down the well, turn to page four. One time I tried reading this book straight through, without following it by its rules. That is what watching this film was like. OK, now my stories may be over and done with. But these filmic facts are not: (1) This film was recorded with the use of hand-held cameras and shot in chronological order [although it was not depicted that way]. (2) Benicio del Toro was an extra in the Madonna video 'La Isla Bonita'. (3) Originally Katrin Cartlidge was cast as Marianne, but she died shortly before filming started. (4) Sean Penn lost his home in the 1993 Malibu fire. (5) Naomi Watts accepted her role without even reading the script. (6) The woman's name that is etched upon the belly of the prisoner who saves Jacks life, 'Maria Eladia', belongs to the wife of the director, Alejandro González Iñárritu, whom he dedicated this film to. (7) Alejandro was the very first Mexican to receive an Oscar-nomination for Best Director. (8) The poem Sean Penn's character quotes in the restaurant to Naomi's character is from 'La Tierra Giró para Acercarnos' by Eugenio Montejo. (9) In the original screenplay, Cristina's last name was Beck and not Peck. And (10) The title of this film comes from an experiment carried out by Dr. Duncan MacDougall, of Haverhill, Massachusetts. He weighed down dying subjects with the intent of proving that the soul was actually a measurable commodity. Obviously the results were inconclusive. Well, so far, you have had facts, and you have had my own personal take on the story. 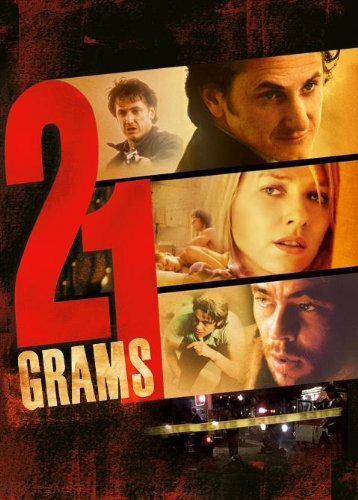 However, was '21 Grams' any good or not? To me - yes - I loved it. But it is one of those movies you have to watch without any distraction, and concentrate very hard on, so you can figure it all out. Heck, even a bit of a swat like myself found it kind of difficult to follow at first. One minute one character was doing one thing. And the next minute the same character was doing something else. Plus the passage of time just zipped backward and forward, without no explanation what so ever. But I have to admit, by the thirty minute mark, all of a sudden this changed for me. I could start to see what this film was trying to do, and also why it was trying to do it. Also, by the very end of the film I understood the 'bigger picture', and could percieve the whole as a 'whole'. Still, a small part of me does wonder what this movie would have been like if it was played in a sequential order. Would I feel that it was pretty mundane and boring? Or would I still get a intellectual kick out of it? The latter I presume. But I will never really know unless the makers repackage this picture into '21.2 Grams' or something. Anyway, overall, this was a really great flick. All the actors were on top form. The supporting players really did support. And the style and the pace of this film was something that was original and new. A must watch for people with patience.